A new report by SNL Metals and Mining on exploration spending by the largest mining companies, documents the shifting sands in the mining industry last year as the sector began to turn around. SNL, part of S&P Global, notes that larger players allocated a total of nearly $2.2 billion for non-ferrous exploration during the year. Companies with the 20 largest exploration budgets in 2016 accounted for 31% of the just under $6.9 billion worldwide exploration total. 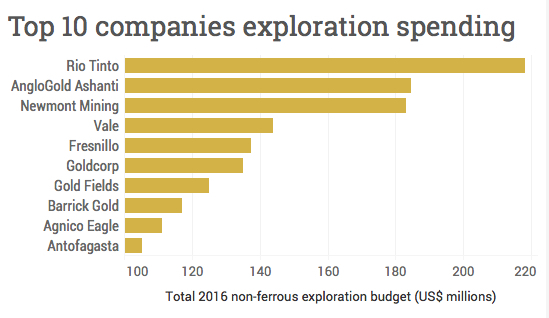 The top 10 companies were responsible for over $1 of every $5 spent on exploration worldwide last year with combined budgets of some $1.46 billion. Exploration for gold represented 56% of the total budget of the largest players – gold companies usually dominate the top 20 list. Together copper and gold account for 90% of the budgets of the top 10 companies. The 12 largest gold miners spending on exploration came to 37% of worldwide gold allocations. Two companies, Canada’s Agnico-Eagle and South Africa-based Gold Fields joined the top ten for the first time spending $111 million and $125 million respectively. Last year’s top spender AngloGold Ashanti allocated nearly half its $185 million budget to brownfield projects with the lion’s share going into Colombia. 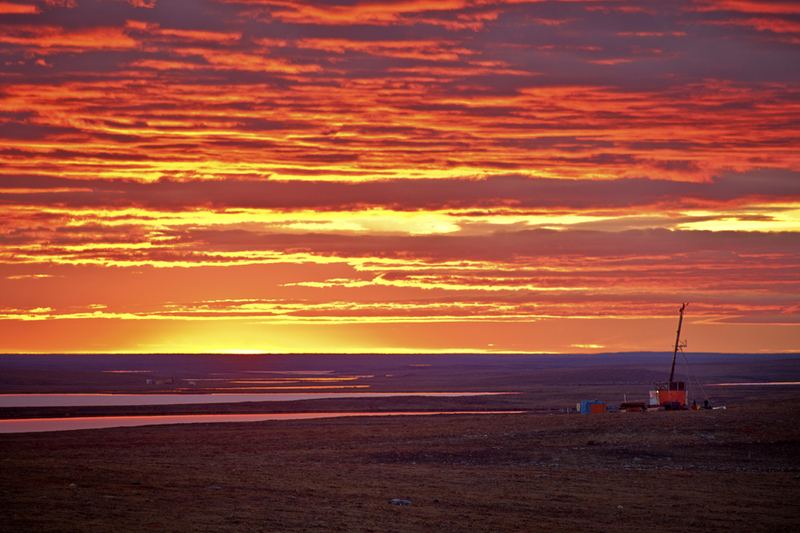 Larger players represented 34% of the global total spent on copper exploration. In turn two companies, Rio Tinto and Antofagasta accounted for nearly half of the spending by the top 20 companies delineating and finding copper deposits. SNL also notes that Rio Tinto was one of the few major mining companies whose planned exploration spending increased in 2016, up about 19% to $218 million. The Melbourne-based company was also the only large firm to spend money ($20 million) on uranium exploration. Despite the weakness on uranium markets, total global spending on uranium was $284 million last year, nearly as much as was spent on diamonds and surpassing exploration dollars for nickel. A persistent financing drought has squeezed juniors' budgeting to the point that the majors have become the biggest drivers of early-stage exploration. The only other diversified mining company in the top 10 – Vale – spent $51.5 million looking for copper and $41.5 million for nickel. Allocations for other minerals were mostly focused on phosphates and potash in Brazil and Peru. Overall diamonds accounted for 8% (with Alrosa and De Beers responsible for about 54%) and other targets, including silver, potash, phosphates and manganese made up 7% of the spending by larger players. Conventional wisdom holds that the major companies leave grassroots exploration to the juniors. It may therefore be surprising that the larger players contributed 34% of all greenfields allocations in 2016. Similarly, the larger players traditionally dominate minesite spending; however, in 2016 they accounted for only 37% of the near-mine work, as their investors demand improved returns over growth. It is also interesting to note that the major players were responsible for just 25% of late-stage and feasibility work.